Nestled in the back of the main floor, the Center for Teaching, Learning and Research (CTLR) is, physically speaking, just a small part of the library. But despite its limited size, its reach extends into every conceivable area of campus. The Center hosts faculty development events almost every week, and every day student tutors run one-to-one and drop-in tutoring sessions in writing, foreign languages and STEM (science, technology, engineering and mathematics) subjects. The Center also organizes the annual Spring Symposium, a massive affair that takes over Bicentennial Hall with presentations of the finest student research. The CTLR’s secret weapon is its student staff. Student tutors spend weeks each semester in training, learning how best to serve their student colleagues needing assistance, within the bounds of the College Honor Code. 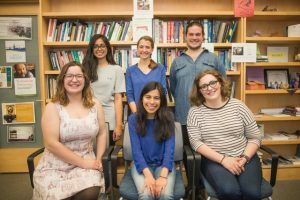 Student office workers are responsible for setting up and tearing down after these sessions, as well as staffing larger events like the Symposium and the yearly Ward Prize ceremony. Every student who comes to the CTLR looking for assistance—from seniors inquiring about research grants to first-years making their first tutoring request—will likely speak to a student worker. 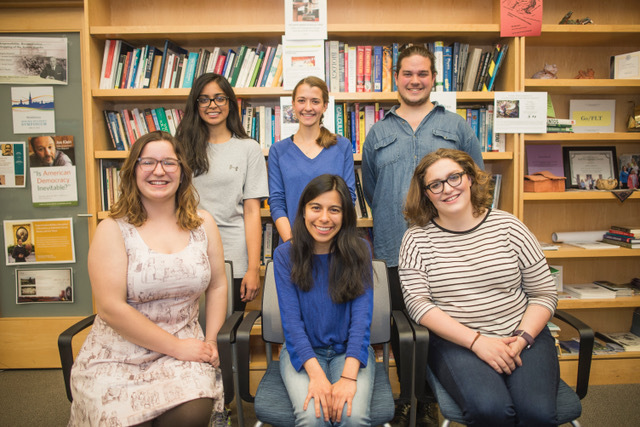 None of this work would be possible without the Center’s seven student supervisors. Sabina Haque, ’18, Head First Year Seminar Mentor, describes her job as “mostly people management,” and this sentiment is echoed by Sadie Dutton, ’19, STEM Peer Tutor Supervisor, who describes her job as making sure the “extensive network” of STEM tutors “runs smoothly.” Much of the scheduling—of drop-in writing tutors and of the office staff that sits behind the desk from noon to midnight—is done by student supervisors, and it often falls to student supervisors to make sure their colleagues follow through on these obligations, or to follow up when these obligations are not met. A consistent theme in how these student supervisors talk about their jobs is the way their tutoring work relates to confidence. Julia Desmarais, ’18, Head Writing Tutor says the best part of her job is “working with someone who comes in worried about an assignment, and watching them leave feeling much more confident and assured. I love to see that difference and to know that I’ve made their night a little less stressful.” Nina Colombotos, ’18, Student Supervisor for Foreign Language Tutoring, places the idea of confidence in a slightly different context: “Many of us got to Middlebury by being self-driven and independent, and that’s a great thing. But everyone can benefit from meeting with a tutor, regardless of the subject area. I hope we can work on rethinking the stigma around asking for help at the College.” Tutoring can be a way to give students confidence in their intellectual capabilities, but it can also make them more comfortable asking for help. Although their jobs range far and wide, the CTLR student supervisors are glad to work there. They cite various skills gained from working at the CTLR, including “administrative responsibility,” “the ability to communicate ideas clearly and effectively,” and an aptness for “see[ing] a certain subject through another’s eyes.” The CTLR is not only a valuable resource in students’ academic growth, but also an important place for working students to gain professional skills. These are strengths that they can apply not only in other positions on campus, but also as they move into new chapters of their lives.